In general, dynamic sorption methods are widely used for characterization of porous materials. With these methods, a gas is flowing over (e.g. dynamic vapor sorption, rapid dynamic flow) or through a sample (e.g. breakthrough curves, inverse gas chromatography). The sample can be weighed and/or the effluent gas flow has to be analyzed. In breakthrough experiments and inverse gas chromatography, the sample has to be arranged as a fixed packed bed. While in breakthrough experiments, a gas flow with an inlet step in gas composition is used, in inverse gas chromatography a pulse function of the composition is applied. In the next figure a simplified scheme of a breakthrough apparatus is shown. Uusally such a setup consists on a gas dosing and mixing tool (left side in the figure), an adsorber unit (center) and an analytical device or detector, respectively (right side). Schematic setup to determine a breakthrough curve on a fixed bed adsorber. The shown setup consists of a gas dosing system for a binary mixture, an adsorber with the sample under investigation, and an analytical device to analyze the effluent gas mixture. 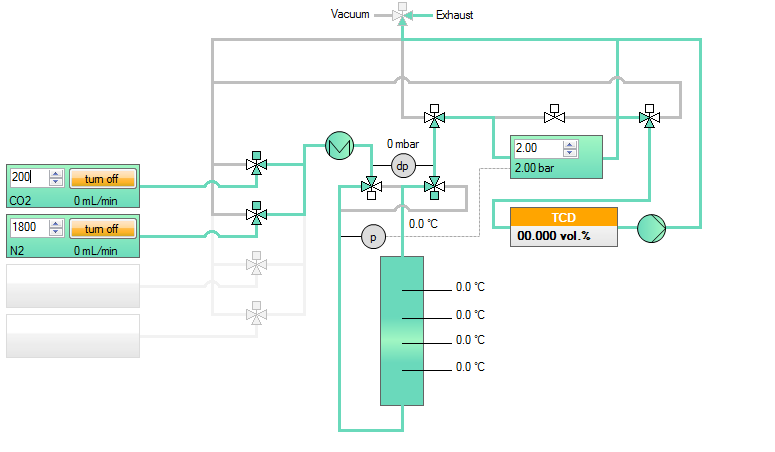 In this example the adsorber is equipped with 4 temperature probes, a differential pressure sensor and a pressure sensor for absolute pressure in the column. A breakthrough experiment starts typically with switching the inlet gas from a pure carrier gas to a mixture with the desired adsorptive concentration. 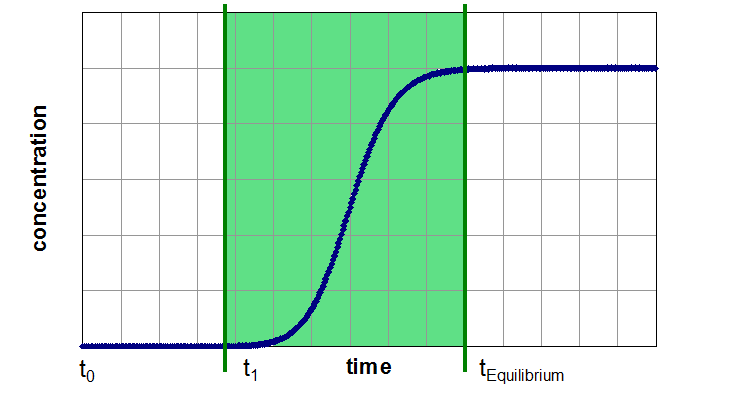 Therefore, the concentration function at the adsorber inlet is a step function. Now the effluent concentration of the adsorptive is time-resolved measured. During the first part of the experiment, the adsorber can retain the adsorptive a certain time (Segment 1). 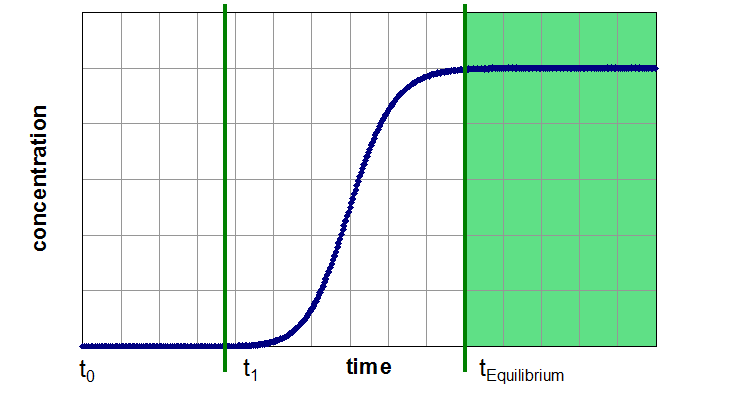 If the capacity of the adsorbent exceeded, the concentration of adsorptive in effluent gas flow will increase up to the inlet concentration (Segment 2). 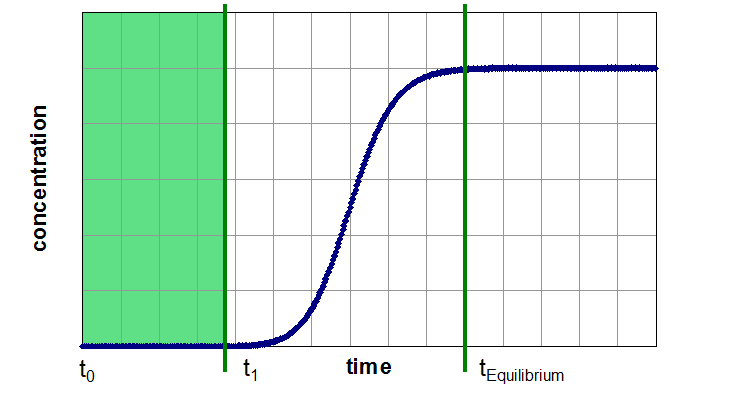 Afterwards the adsorber is in equilibrium with the gas mixture under the present conditions and no change in gas concentration, temperature or other thermodynamic variables can be observed (Segment 3). Due to similar conditions like in industrial plants, the kinetic data based on breakthrough curves are in most cases suitable for upscaling. Due to the possibility of automatization, dynamic sorption methods are one of the most time-saving methods for the determination of mixed gas adsorption equilibria.